There are wide variations in surgical technician salary around the globe. However, statistics available show that surgical technicians and technologists are among the best-paid allied health professionals worldwide. Their annual salary can be as high as $80,000 in the U.S. according to the Bureau of Labor Statistics. This is welcomed news to those who are seeking to become, or are already, a surgical technician. The major reason why surgical tech salary has such a high ceiling is due to the level of training and experience that one is expected to possess. Surgical tech students go through a great deal of classroom instruction and are also required to demonstrate their skills in a clinical setting before being allowed to graduate from surgical tech school. Being a surgical technician is also demanding and this is reflected by the salary offered by employers. The individual is responsible for performing a wide range of crucial tasks during surgeries, and is also expected to maintain the sterility and safety of both tools and the operating room itself. Individuals who pursue education at higher levels through surgical tech schools can find employment with various companies around the globe. The top recruiters of surgical tech graduates are referral hospitals. Referral hospitals are labor intensive and require a steady supply of new employees. Salaries can vary from one area to another. This variation may also exist among the firms that employ graduates. The actual surgical technician salary offered by a firm depends on several factors such as experience, nature and scope of work, and several other variables. Previous work experience is a major factor that is normally used in determining surgical technician salary. Proficient technicians earn more money as compared to their inexperienced counterparts. Recruiters usually require that trainees undertake an internship while still in school to boost the trainees’ experience. These internships could be paid or unpaid jobs. There are numerous institutions that provide job placement to trainee technicians. Surgical tech trainees also have opportunities to learn while on working. It is critical that newly-certified surgical technicians start boosting their salary early in their careers. This can best be achieved by acquiring additional, specialized certifications. Any person interested in this career, and in earning the best salary possible, can also seek advice from knowledgeable job placement firms. After you have completed your training you may want to look in to a getting your certification for sterile processing technicians to be able to compete at a higher level. In the past certification was strictly voluntary for sterile processing technicians except in New Jersey but this has been rapidly changing over the past few years. More and more states are looking in to following New Jersey’s lead by requiring certification for this profession. But the question remains, should you do it? In the following article we will discuss the certification process and what you would have to do to become certified. Plus, we will look at why it is a good idea to take the extra step to become certified. It might seem strange that certain professions such as a professional message therapist or a truck driver would need some sort of certification for employment but the person in charge of sterilizing medical devices would not legally need to be certified. Almost every other healthcare profession has regulations that require certification and yet in one area that deals infection control and safety of medical instruments in the operating room does not have such a requirement. As mentioned earlier, the certification of sterile processing technicians has been voluntary for a number of years. It wasn’t until 2004 when New Jersey passed the first law requiring that central supply technicians were to pass a certification process. Some states such as New York and Pennsylvania have considered adding this law to the books, most states seems to be blind to it right now. While there may currently not be legal reasons why sterile processing techs should become certified, a growing number of hospitals and medical facilities have started to make this a requirement for hiring. Having your staff certified in their respected positions is only a positive for the healthcare facility since the general consensus is that the public feels safer and more at ease knowing that someone has been specially trained for their position. Plus, there is a level of accountability with those professionals that have been certified. There are two organizations that currently provide certification for sterile processing technicians; the Certification Board for Sterile Processing and Distribution (CBSPD) and the International Association of Healthcare Central Service Material Management (IAHCSMM). Each certification body has their own requirements for certification and certification types. Let’s look at each organization and their certification process. The CBSPD offers two certifications of note; the Certified Sterile Processing and Distribution Technician (CSPDT) and the Certified Surgical Instrument Specialist (CSIS). There are separate requirements for each of these certifications as well as testing and fees. Both of these exams are valid for five years and will require re-certification or continuing education in order to be re-certified. The CSPDT certification exam is roughly two hours long and have 125 questions with a minimum score of 70% to pass. In order to take this exam you are required to: complete a sterile processing technician training program or have at least 12 months experience as a full time sterile processing tech or 6 months experience in a related allied health as well as performing sterile processing or 12 months in a healthcare product sales or service related to sterile processing. The CSIS certification exam is two hour timed test with 100 questions and a 70% or higher passing grade. In order to take this exam, you would need to be CSPDT certified and completed a surgical instrument processing class or have 24 months full time experience as a sterile processing technician or completion of a surgical instrument processing or surgical technology course or 24 months experience as a surgical instrument sales or service position. You will have to become a member of the IAHCSMM in order to take either the Certified Registered Central Service Technician (CRCST) exam or the Certified Instrument Specialist (CIS) exam. A benefit of becoming a member of the IAHCSMM is that they provide training programs that are helpful to their certification exams. Your IAHCSMM certifications are valid for one year and require continuing education programs and a yearly re-certification fee. The requirement of the CRCST exam is at least 400 hours of work experience as a sterile processing technician. Unlike other exams, you can accrue your experience before and after passing the exam as long as it is within six months. 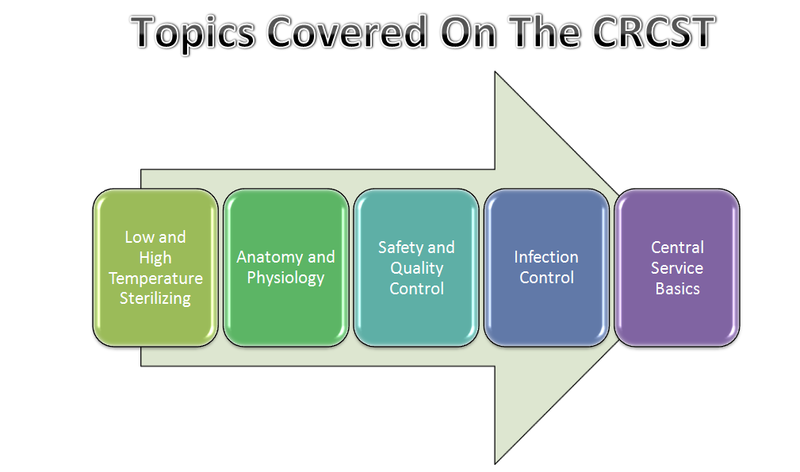 The CRCST will cover infection control processes and general central service knowledge. Once you have passed and received your CRCST certification, you are eligible to take the CIS. As the name implies, you will be tested on a range of medical instruments as well as instrumentation skills. As mentioned earlier, currently New Jersey is the only state that requires certification for sterile processing technicians but there are other states considering this requirement in the future. Even though right now you may not need to become certified, it doesn’t mean that you shouldn’t seriously consider doing it. Becoming certified as a sterile processing technician will give you and your patients a stronger sense of professionalism. You have shown that you are taking your career seriously and you keep up with the latest changes in the healthcare industry, especially with medical technology. Another to become certified is money. Your employer and prospective employers may increase your pay in return for your extra effort. Let’s face it, you may enter this field to help others and have a long, industrious career in the healthcare industry but money is important Being able to both improve your salary as well as the quality of your employment is a pretty big reason on why getting your certification is a good idea. As we have seen, currently outside of New Jersey there isn’t a legal reason to get your certifications as a sterile processing technician. 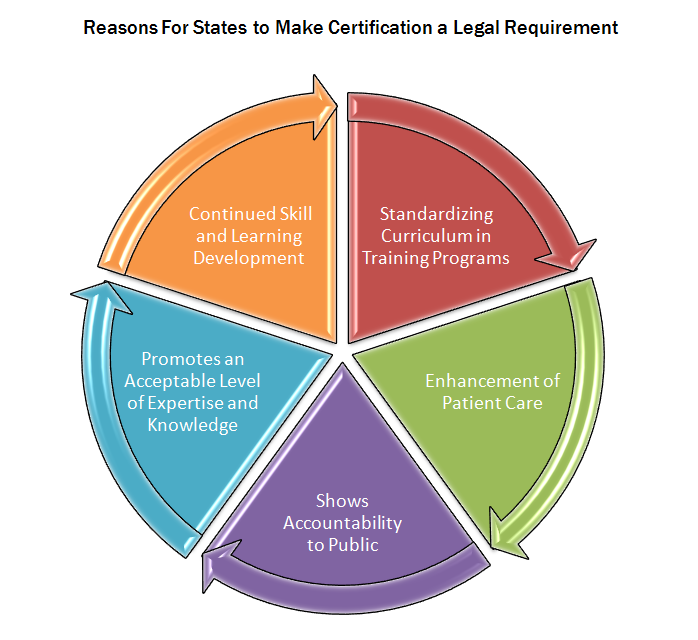 Even though it isn’t legally required, there are plenty of reasons to become certified from a professional or monetary standpoint to even getting ahead of the curve as more states look to add this requirement in for sterile processing techs. By going the extra few steps for certification, you are just bettering your chance for a longer and more prosperous career as a sterile processing technician. As an entry level position, training to become a sterile processing technician is fairly easy, especially compared to other healthcare professions. In this article we will discuss some of the ways that you can become a sterile processing technician including training and personality traits one will need to know to enter this profession. While education and experience are important, sometimes it is the actual person that makes their job a success. Like most jobs, your personality will help determine your success as a sterile processing technician. It is possible to do well in this job without a drive and passion for keeping people safe, but your chances of this are fairly slim. You need the right mindset and personality to be a great sterile processing tech. 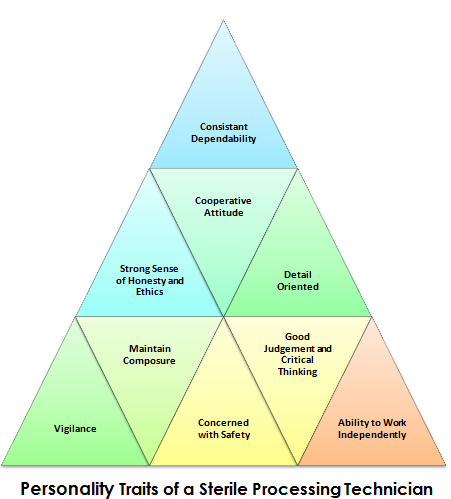 Below you will find a chart that covers some of the top traits that help make one successful in this career. Depending on your long range professional goals and where you live or plan to work, there are different paths in which a person can travel to become a sterile processing technician. The two main paths are on-the-job training and a formal educational training program. There are both pros and cons to each of these training paths so let’s look at them individually. In some areas of the country where competition for these positions are low, you may get hired by a hospital and undergo an on-the-job training program. In some of these cases, it is very possible to get hired as a sterile processing tech with just a high school diploma or the equivalent. The positives of this training path seem fairly straightforward. You will gain real work experience and a paycheck while being trained as a sterile processing tech. This is great for those who are looking for a healthcare related profession but either do not have the resources or the desire to go through a formal educational program. The possible negatives of the on-the-job training would be the lack of a degree or certificate. Even though experience and proven competency are important, an increasing number of medical facilities and states are adding formal training as one of the requirements. This would probably mean that you would be grandfathered in your position but it may be harder to change your place of employment. If you have decided to go the more formal education route, you will find that most community colleges and vocational schools offer sterile processing technician training programs. These training programs take upwards of nine months and normally split between the classroom and a hands-on or externship to give the student some real life experience. While the actual curricula may be different from school to school, you will cover a number of topics found in most healthcare programs such as medical terminology and ethics. 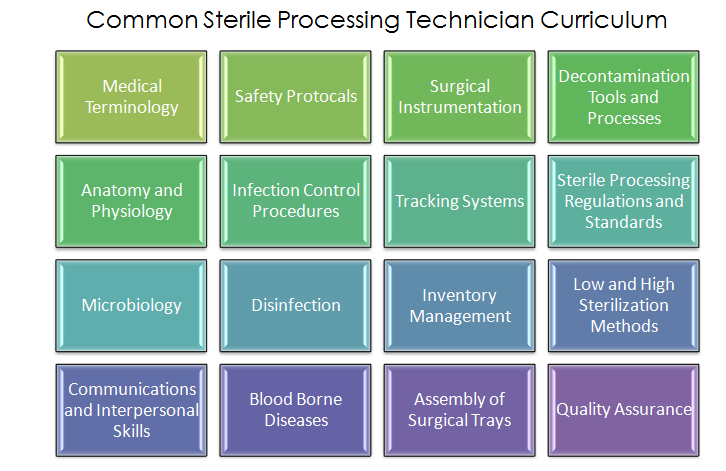 Some of the more specific sterile processing technician subjects such as decontamination tools and sterilization processes will be emphasized. The chart below lists some of the topics normally covered in class. Even though completing a formalized training program does not mean you automatically mean you have a job, it does show potential employers that you are serious about your career. With a certificate in hand, it will most likely be easier to gain employment than someone without the formal background. Another positive is the chance for a higher salary as most professions reward education since these medical facilities would not have to pay for your training. On the negative side, you will need to spend money in order to attend one of these training programs, which can run for several thousand dollars. Not to mention the amount of time to study and attend classes meaning that it may be hard to hold a job at the same time. Recently we’ve also seen a growing number of online schools provide the proper training program for those interested in sterile processing technician career. Online schools provide a great service to those with busy schedules who are looking to improve their station in life. Being able to set your own schedule when to attend your online class is a bonus for those with kids or a full time job. The one major down side is that you will still need to complete the laboratory section of the class to receive your certificate. 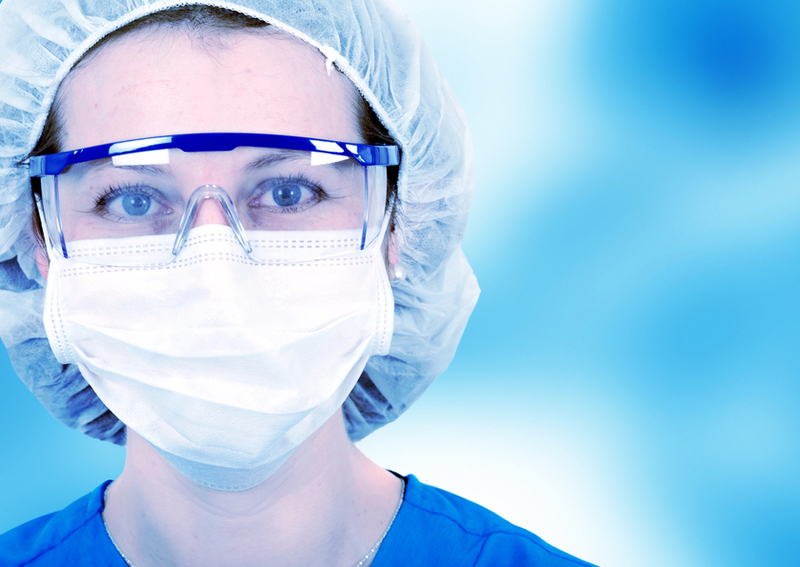 Becoming a sterile processing technician is a great way to enter the world of healthcare. The prerequisites have a low barrier as compared to other healthcare professions. The decision on which route you would like to go so far as on-the-job training or a formal training program is one you will have to make by listing your priorities of getting a job quicker or making a larger and potentially more lucrative commitment to your career. There are a number of unsung heroes in the healthcare industry, probably none more so than that of a sterile processing technician. Working mainly outside the limelight of other professions, sterile processing technicians work hard to prevent infections and other possible medical complications. Their work is so vital that most modern medical facilities would have a difficult time functioning without them. It is hard to imagine that this profession makes such an impact on healthcare but still most people have never heard of a sterile processing technician or know what exactly they do. In this article, we will be looking at the position of a sterile processing technician and what duties they perform in order to give a little credit to this unnoticed profession. To put it plainly, a sterile processing technician is a specially trained healthcare worker that uses their specialized skill and knowledge to clean and sterilize medical instruments, equipment and supplies. This process is extremely important since most modern medical facilities will use thousands of medical instruments and equipment on a monthly basis. If the cleaning and sterilization is done correctly, then these can be reused safely, thus reducing preventable and possible life-threatening infections. 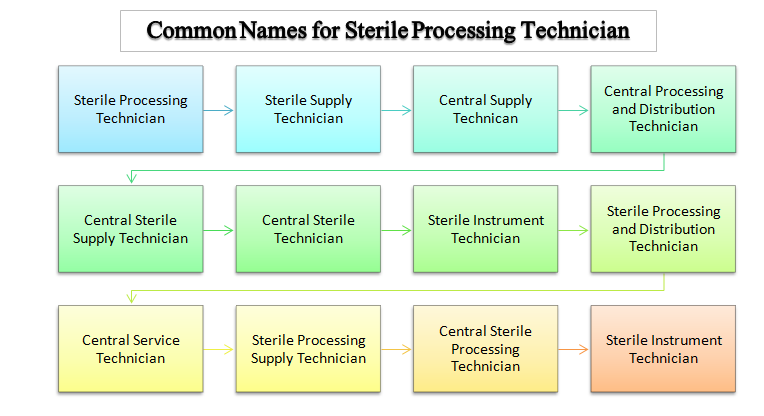 Where Do Sterile Processing Technicians Work? Sterile processing technicians work in any number of healthcare facilities, but most find work in hospitals and surgical centers. Normally there is a specialized department that is set up in an area that can be controlled for proper sterilization purposes, commonly called sterile processing and distribution department. The SPDD is generally comprised of five mini groups for the process of sterilization. The importance of their duties cannot be stressed enough when considering the alternative. Even though it is relatively rare, diseases such as HIV and hepatitis as well as surgical site infections (SSI) are a few of the possible problems that may be transferred from improperly cleaned instruments and equipment. Let’s face it, patients have a preconceived expectation that any procedures performed at, the medical staff of and everything else to do with a healthcare facility is safe environment from potential infections. While it might be a bit of a reach to believe that hospitals and other medical facilities are completely sterile and free of life-threatening germs, infection prevention starts with the sterile processing technician. So even though sterile processing technicians may not get the accolades and praise they deserve, their work behind the scenes is extremely necessary to help curb infections and make a hospital stay a little safer. If you are looking for a challenging and rewarding career in healthcare, you might want to look in to training programs to become a sterile processing technician. If you are considering a career in the medical field, but are looking for something a little different, you may want to look into working as a traveling surgical tech. Surgical techs only represents a small portion of the allied health sector, but there are plenty of growth opportunities in the field for experienced practitioners. While you will find that many surgical techs complete additional training to become circulating techs or surgical assistants, some go on to specialize in a particular area, such as open-heart or orthopedic surgery, in order to boost their salary potential. For this reason, one of the hottest trends in the field today is becoming a traveling surgical tech. What Are Traveling Healthcare Jobs? Traveling jobs have always held a certain appeal for individuals who have a bit of wanderlust. Likewise, there has always been a need for staffing agencies to find skilled workers to fill vacancies. As hospitals increasingly turn to medical staffing agencies for a job-ready workforce, the demand for experienced health workers continues to rise. Where surgical techs are concerned, the demand is often greatest at small to medium-sized hospitals that need to fill vacancies left by staff on sick leave or maternity leave. 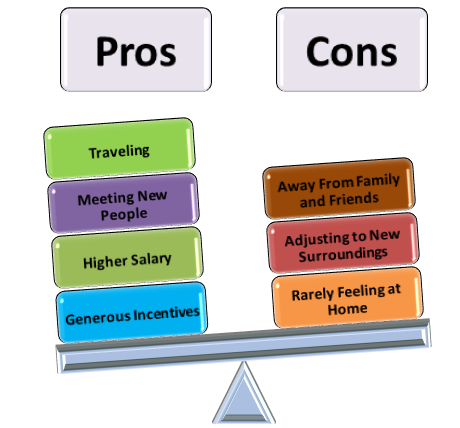 There are pros and cons to all jobs, and the same goes for traveling surgical tech jobs. Flexibility is one of the biggest advantages to these temporary travel positions. Most agencies offer three- to 12-month contracts. The short duration of these assignments seems an ideal match for those that need employment but do not want full-time jobs. If you sign-up with an agency, and you decide the assignment is not to your liking, you can choose an assignment at a different location at the end of your contract. The median wage for a traveling surgical tech job is in-line with industry standards. Generous incentives are available, too. It is not uncommon for agencies to offer sign-on, completion and referral bonuses. A growing number of these agencies also offer furnished housing and food allowance. For many, the lure of getting paid to work in a variety of settings is an added benefit. As a traveling surgical tech, you have the opportunity to explore new areas across the country. The idea of seeing new places, trying new foods and new patients each day is a reward all its own. The flip-side to this idea is that traveling techs spend much of their time away from family and friends. Moving to a new place can create feelings of anxiety and isolation. Sometimes people have trouble adjusting to new climates. Healthy individuals take up to two weeks to acclimate to new altitudes and temperatures. Coping with atmospheric changes and long shifts can disrupt biological rhythms and work performance. Traveling surgical tech jobs are not for everyone. Those likely to become traveling surgical techs are those who are open to new experiences fair better than those who desire familiarity. If you are a student working toward your surgical technology certification, you will want to gain as much experience in as many different settings as possible. Medical staffing agencies prefer experienced candidates with a vast working knowledge. If you are currently working as a surgical technician, and you are still not sure about committing to travel, consider jobs that pay per diem. You can work in various locations and be close to home. If you like it, then may want to try becoming a traveling surgical tech and see if you can cure your wanderlust. After completing your training and exams, now is the perfect time find a surgical tech job. While job hunting can be painful and somewhat degrading, there are plenty of tools and resources that can help avoid a lot of the pain. Surgical technology, like most healthcare occupations, weathers bad economies and other factors that seem to cripple other occupations. In fact, surgical technologists are one of the fastest growing occupations in the healthcare field with a projected growth of 19% until at least 2020. According to the Bureau of Labor Statistics (BLS), the average median salary for surgical techs in 2010 was $39,920. However, your surgical tech salary will depend on experience, specialty and your location in the country like most healthcare occupations. It should not come as a surprise that a vast majority of surgical techs find employment in surgical hospitals but there are positions in outpatient care centers and dentists offices. 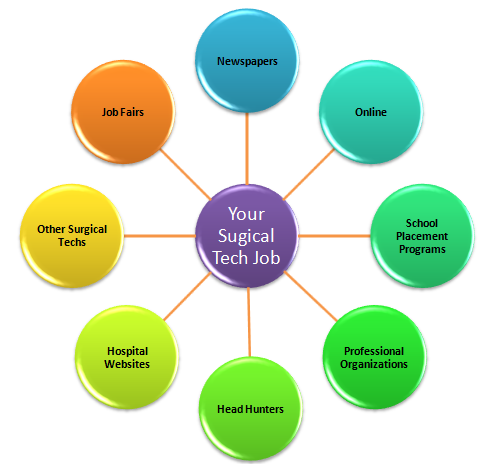 Below we have listed a number of different ways that can help you land that surgical tech job. Newspaper – It might sound a bit old school, but you would be amazed on the number of healthcare facilities that still rely on the newspaper for their job listings. Online – Besides the big national sites like Monster.com or Indeed.com, you can look for more localized information like Craigslist. It also doesn’t hurt to just type in “surgical tech jobs” as a keyword in your search engine. School – You will find that most schools and colleges have a job placement service or job boards that can help you start your search. Professional Organizations – The Association of Surgical Technologies has a great site that offers a lot of information, but most important to you is their job board. 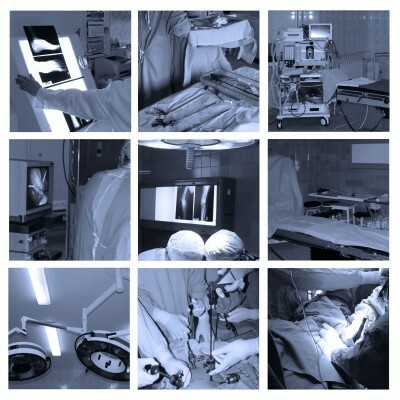 You can also join surgical tech groups on linkedin.com which at times will announce job openings. Head Hunters – There is headhunters specializing in healthcare such as Healthecareers.com and Medicalstaffrecruiters.com. Hospital and Healthcare Websites – Look through the career centers at local healthcare facilities to see if there any listed openings in your area. Surgical Techs – Another good place to go is other surgical techs including your former classmates. Someone might know of a job opening or keep you in mind if they hear of an opening. Job Fairs – Keep an eye out for local job fairs, especially those dealing with the healthcare industry. Talking to the recruiters is a great way to get your name out there. Hopefully these tips on finding a surgical tech job will help you out. While there is no sure way path to finding a job, at least you know that your position is in demand and have the tools and resources to better your chances. Good luck on your search! Those choosing to become a surgical tech are potentially looking at a very rewarding career, especially for those with the acumen for science and medicine. You will find yourself in the thick of things when it comes to helping surgeons perform their duties properly and will be part of a very important team when it comes to saving lives. A surgical tech, also known as a surgical technologist, is a trained professional with either a certification or associate’s degree from an accredited program. As a member of the surgical team, he or she is a valued member whose job starts before the surgery and ends well after it has been completed. The technician helps set up the operating room and all of the equipment and instruments before the operation begins, and also makes sure all of the equipment is working properly and the room is disinfected and sterile. They are also responsible for preparing the patient for surgery by cleaning and positioning the sterile drapes. During the surgery, surgical techs will hand the instruments and any supplies to the surgeon and first assistants. An experienced individual will anticipate what is needed at certain times and will be ready for anything that may pop-up during the operation. The technician will also be in charge of helping monitor vital signs and keeping a record of the operation and treatment. After the surgery, you will find surgical techs restocking the operating room and cleaning and sterilizing the room and equipment for another day. They are also tasked with helping transport the patient to the recovery room. It is safe to say that they are probably some of the busiest members of the surgical team. Choosing the right school is largely a personal process that requires the student to have a firm understanding of his or her needs. Knowing how much time you can devote to schooling and how much can you afford for tuition. Finally, you have to decide whether or not you would like to attend one of the many fine and accredited online classes or attend a traditional on-campus program. If you find a surgical technology program can satisfy all of your personal needs in these areas, then it is certainly worthy of your consideration. One of the first steps to becoming a surgical tech is finding an accredited surgical tech program for you to attend. You will find these programs in a number of different types of schools such as vo-tech, community colleges, traditional colleges and online schools. Just make sure that it has been accredited by the Commission of Accreditation of Allied Health Education Programs (CAAHEP). Different types of accredited surgical tech programs may offer certificates or you may go for your associate’s degree or bachelor’s degree. In order to enroll in an accredited surgical tech program, you will need to have at least a high school diploma or an equivalent degree. Some programs may have requirements such as an entrance exam or an interview. It is best to talk to the admissions department of any school or program you are interested in to find out what exactly they require for entrance. 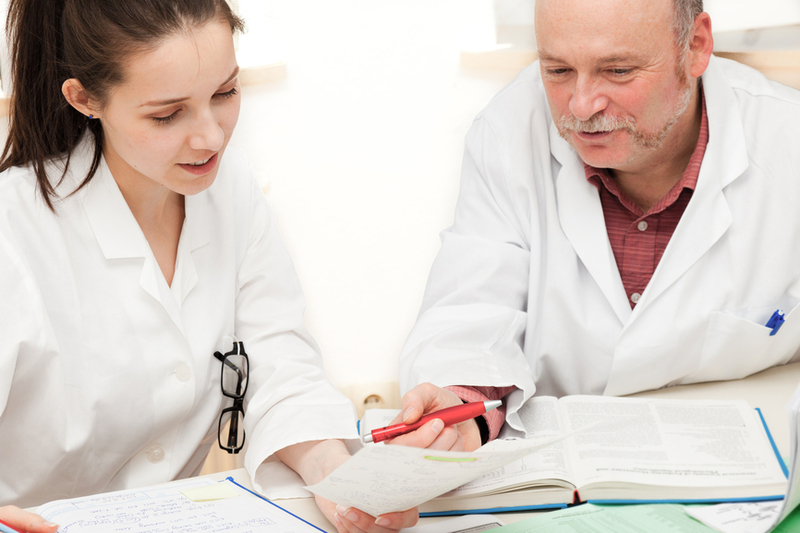 Your education will be split up between classroom lessons and lab or clinical practicum. In the classroom you will going over an array of medically relevant topics such as physiology, medical terminology, medical ethics, chemistry, math, anatomy and patient care to name a few. This part of the program is teaching you the theories of medical practice that will be necessary not only for your exam but also for your practical experience working as a surgical tech. A crucial component of any surgical tech training is the clinical work experience. Tech trainees enter clinics or hospitals as externs in order to gain hands-on work experience. Most programs have relationships with hospitals to make externships easier to acquire. They observe surgeons during operations and perform tech duties under the supervision of the surgeon. This hand on work will help set the long term career future for surgical techs. A tech trainee will learn about tools and instruments used during an operation procedure as well as the proper sterilization techniques that help prevent infections. Students will learn the value of medications and drugs needed in the course of the surgery. After you graduate from the surgical tech program, you will need to take the certification exam that is administered by the National Board of Surgical Technology and Surgical Assisting (NBSTSA) in order to work and hold the profession title of “certified surgical technologist”. The exam consists of three areas; Perioperative Care, Additional Duties and Basic Science. Each of these topic areas are composed of questions based on recall, application and analysis. If you paid attention in class and in your externship, you should not run in too much trouble during this exam. However, it is advised that you try some practice tests and study so that you will be able to pass the exam without much worry. It is better to know the information rather than worry if you do know it. After you have passed your exam and gained your new professional title of Certified Surgical Technologist. You will soon be making a difference in other people’s lives as a successful surgical tech. When you came to this page, you were wondering how you could become a surgical tech and now you have a greater understanding. Hopefully you will fully consider this profession as it is an important one with lots of opportunity. “What is a surgical tech?” you ask? They’re one of the most important people in the operating room! Most patients are under the rather mistaken notion that it’s all up their surgeon to determine their fate. If things go very well, the patients shower the doctor with many praises high fives, thanks, and even gifts. Yes – the surgeons are the key players in any surgery. However, this is no one-man team. Every surgery needs a team: the surgeon, residents, anesthesiologist, scrub nurses and of course, the surgical tech. If you don’t know much about them, you’re not alone. Even though they work in the operating room with the same, ultimate purpose of saving lives, rarely they are noticed. Alright, So What Is A Surgical Tech? Technically speaking, a surgical tech (known also as a scrub tech or surgical technician) is an allied health professional that is also a member of the team in any surgery, at least in some countries. Although not recognized by some states, a surgical technician is actually just as important as the surgeon. His/her job is to try to anticipate the surgeon’s next move so the procedure goes by smoothly and according to plan. Aside from private and public hospitals, surgical techs are also hired by dentists, private clinics, insurance companies and other health-related institutions. What Jobs Are They Expected To Do? Usually, they start out with simple cases and progress to more complex ones. 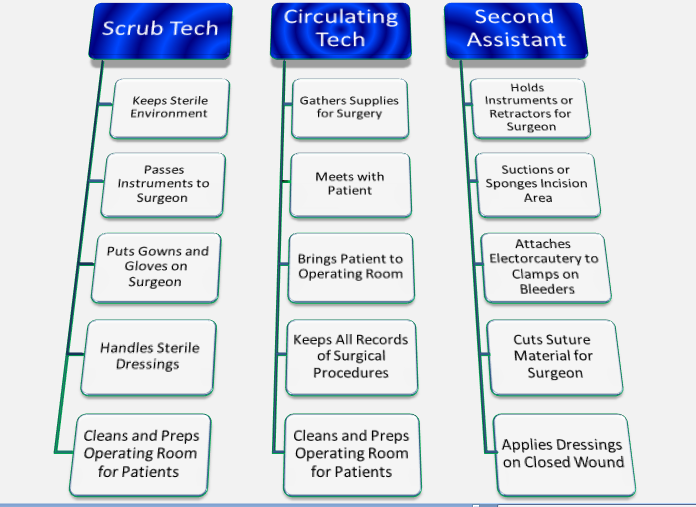 The tasks given to surgical technicians usually vary by country. For instance, in the United States, they can work as unlicensed personnel but only under supervision of a medical doctor or registered nurse. Again, their job is to make sure that the equipment is working properly and that the operating room is conducive for the patient’s safety. However, they can also handle tasks such as closing incisions and checking the patient’s charts. 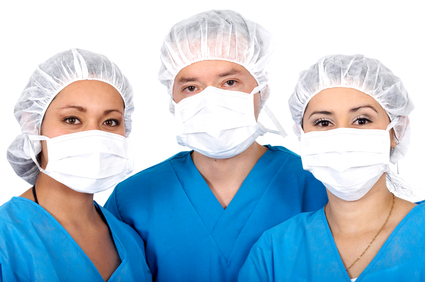 Generally, surgical technicians are some of the busiest members of a surgical team. They have to be present before, during and after the surgery. Before any surgery, surgical techs have to check on the equipment, sterilize the tools to be used, and do additional checking of the operating room. Surgical techs are also the ones who fetch the patient from his/her room, position him/her on the operating table, and check the vital signs and chart. The surgical tech also helps the other team members put on their masks, gowns and gloves. During the operation, the surgical tech has to remain focused since it is his job to pass instruments. After the procedure, the surgical tech makes sure everything is back to its rightful place in the operating room, ready for the next procedure. 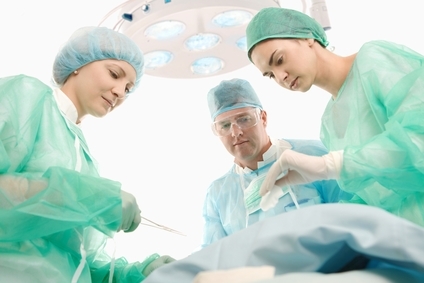 How Do I Become A Surgical Technician? Those who want to be a surgeon but never liked the long wait can opt to become a surgical tech instead. Surgical tech schools and even the military can offer you a diploma, certificate or even an Associate’s Degree within a span of 9-24 months. Among these, a certification is most important in the eyes of most employers. The next time you undergo a procedure, remember to thank the surgical technician too! Just like surgeons, these surgical techs helped save your life. Find the Right School Today!